I took over planning for today’s Diagnostic/Remedial Reading in-class clinical lesson with our ten-year-old boy. 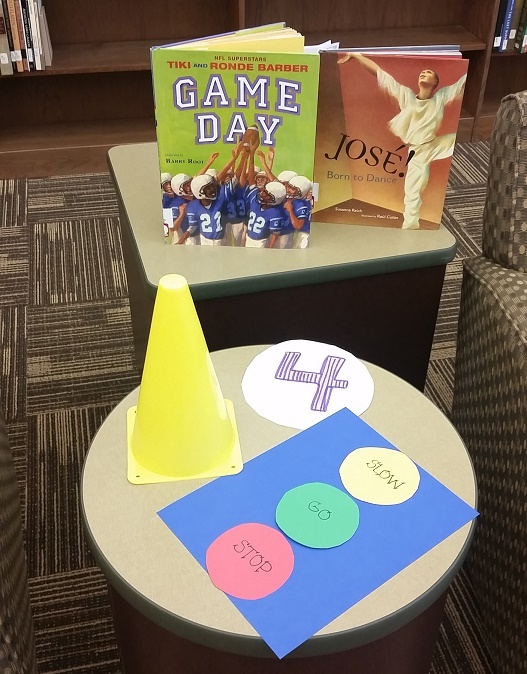 I wanted the focus to be on sports/movement, so I set up five stations with both cones and little number circles. Station 1 focused on silent reading, something my group members and I thought would be useful in measuring comprehension on the student’s own. 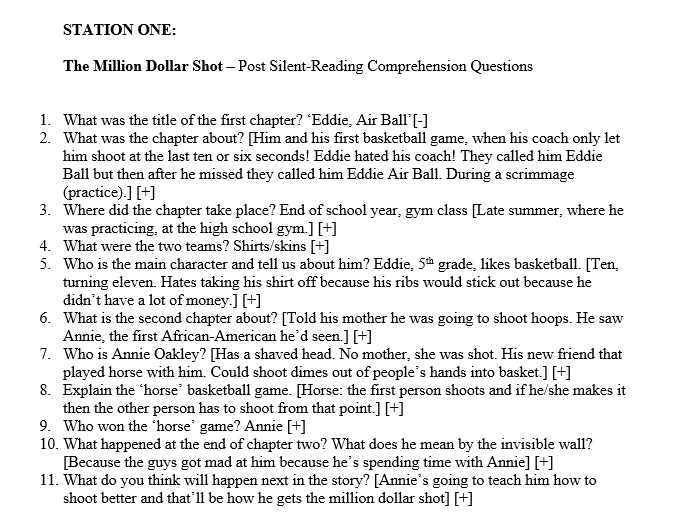 For this, we chose the book, ‘The Million Dollar Shot’ and had our student read the first two chapters silently. After reading we asked him a series of questions orally, which he answered very well! Station two was a writing activity: Choose a sports-related memory/experience and write 2-3 sentences about it. Each member of the group did this independently and then shared. Station three was prediction. The student read the title of a book and then wrote a one sentence prediction of what he thought the book would be about. Station four was a stoplight activity. I created a stoplight out of construction paper with the words ‘STOP’ on the red circle, ‘SLOW’ on the yellow, and ‘GO’ on the green. The object of this station was a game involving fluency. Each group member took a turn reading a page from the story. Whenever an end-stopping punctuation mark occurred: period, exclamation point, question mark, etc. the student would slap the ‘STOP’ button. For any commas, hyphens, ellipses, etc. the student would slap the ‘SLOW’ button. This ended up being game-like in that there was competition between the teachers and student. This was a fun way to integrate comprehension by allowing the student to become aware of the way sentence structure influences intonation. We didn’t reach Station 5 because we ran out of time, but Station 5 was going to be an instructional reading session, where the student and the teachers would take turns reading a chapter aloud from a sixth/seventh grade text—instructional/frustration level. This would then be an activity that would continue for every session after. 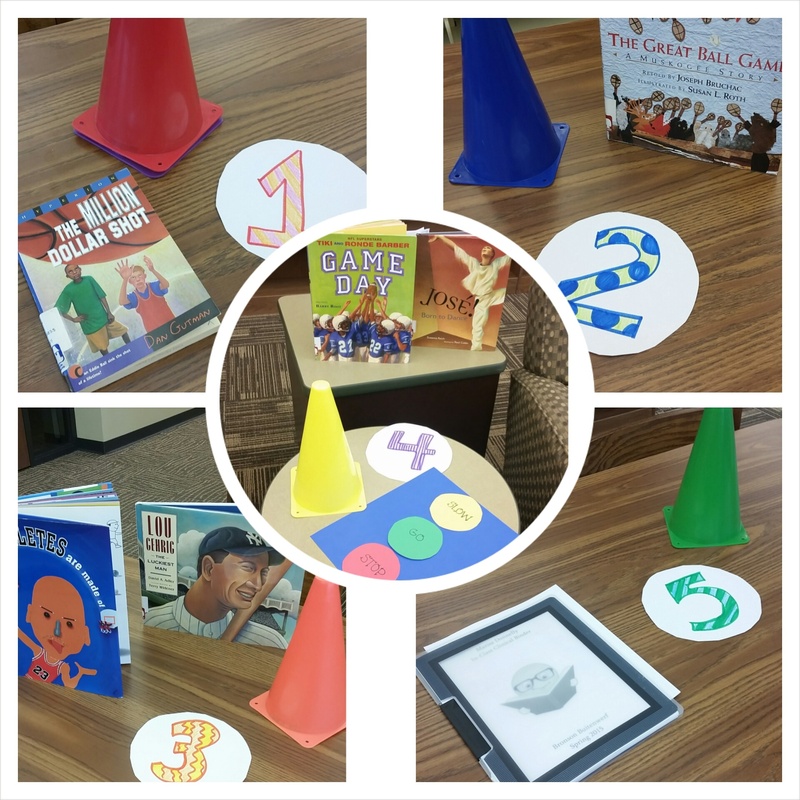 Overall, I think that the sporty theme, cones, and sport-related books were fun! It was also exciting to see our student so engaged in the stoplight activity! I’m excited to meet with him again next week. < Pop Into a Good Book!